ow that the cheap trick that was Beaujolais Nouveau seems pretty much played out the world over, more seems set to be made of the region’s real strengths. Its crus, the Gamay grape, the old vines, its granite, schist and sandy soils, its many small estates and some dedicated vignerons are the fundamentals. Add improved vinification, breathe life back into the soils and promote a willingness to explore different interpretations of just what Beaujolais can be (both a quaffer and something more serious) and more wine lovers should be adding it to their shopping lists. Burgundy’s Mâconnais melts into Beaujolais where a few Chardonnay vines qualify to be sold as Beaujolais Blanc. But the real story concerns the Gamay grape and its predisposition for a radically different growing environment as granite, schist (and in places sand or clay) soils take over from the limestone based soils of Burgundy proper. In these soils old vines seem to count for more than low yields and grapes must be hand-picked as they are subject (in most instances) to a vinification that involves semi-carbonic maceration of whole bunches of grapes. The quality of the fruit can leave much to be desired and too much Beaujolais finishes abruptly with a hard, green edge. Better examples are richly fruity but relatively short-lived with little real structure but easy drinkability. Different interpretations of style do exist however, and some producers get more structure into the wines without losing too much of their charm and quaffability. Jadot and one or two others make the wines in the style of red Burgundy with a similar vinification and oak-ageing as for Pinot Noir-based reds. Though it may not seem worth the effort the difference a dedicated progressive grower can make to the quality of Beaujolais can be a revelation. The best Beaujolais comes from the northern or Haut-Beaujolais, with purer soils and better slopes. 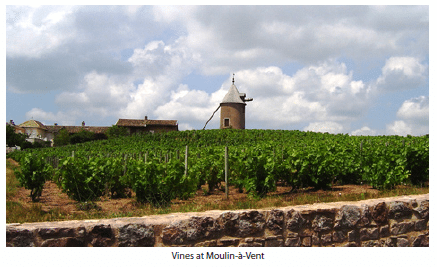 It is sold as Beaujolais-Villages or better still as one of ten recognised crus from within this area. There is a trend to increasing identification of individual climats within the crus. The vineyards of Saint- Amour, where Beaujolais takes over from Mâconnais, are on rather mixed soils and are generally a little unexciting. Juliénas in contrast, from well-positioned slopes and a significant clay component in its soils, is a consistent provider of wines with better depth and intensity than most. Lighter Chénas occupies higher ground than the adjoining Moulin-à-Vent and it is the latter that has the most strength, structure and longevity of all the crus. There are an increasing number of different interpretations from fruit-rich Château de Beauregard examples to the more expressive and burgundian special cuvées of Château des Jacques. The prices are matched only by Fleurie, the best examples of which are perfumed but also often unequalled for their density of fruit and lush texture. Be sure to taste those from Clos de la Roilette, Michel Chignard and Domaine de la Madone Chiroubles has some of the most elevated vineyards in the region; the best wines are light but as refined as they get. At the heart of Morgon is the Côte de Py with its distinctive roches pourries soils of friable schist, the wines are dense and intensely cherryish. Compare and contrast those from Jean Foillard, Jadot’s Château des Lumières, Piron and Louis-Claude Desvignes. Régnié is the most recent cru and rarely exciting (try from Christian Ducroux). The large Brouilly cru surrounds the hill of Mont Brouilly whose slopes provide Côte de Brouilly. The best Brouilly (such as from Château des Tours) can have attractive fruit but much of it is poor, however an increasing number of good examples of Côte de Brouilly are now being made; those from Château Thivin and Nicole Chanrion can be excellent.